Protect pipe bollards while adding bike storage features with Reliance Foundry’s line of bike bollard covers. In this installation method, drop-in concrete inserts are used to install bike bollard covers into existing concrete inside the pipe bollards. It is important to note that adding bike bollard covers to existing pipe bollards will not affect impact resistance. The level of impact resistance is directly related to the original installation. To protect the finish, keep bike bollards in original packaging until the exact moment of installation. Handle with care to avoid scratching or damaging bike bollard surfaces as abrasions will lead to rust. Once scratched, bike bollards cannot be repaired to original form without re-finishing the entire surface. Examine the pre-installed pipe bollard for signs of damage. Any rust should be removed, and abrasions should be covered as soon as possible. If the damage is beyond repair, a new pipe bollard may need to be installed. Hold a level vertically against the side of the pipe bollard and ensure it is plumb. Note: Any damage or tilting of the pipe bollard can affect the performance of the bike bollard cover. Brush or wipe the surface of the pipe bollard. Debris can offset measurements and the placement of the bike bollard cover. Use chalk to mark the center point on the concrete inside the pipe bollard. Tap a pilot hole in the center of the hole marking. This will prevent the rotary hammer from drifting while boring the hole. If depth control is not available, mark 3-1/8″ on the masonry bit. 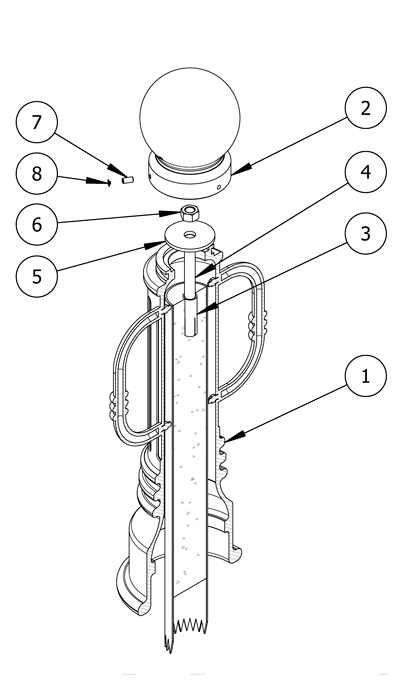 Drill a hole that has a 1″ diameter and 3-1/8″ depth. Ensure the drill is level. Drill on high speed, using the hammer function if available. Check the masonry bit often to ensure it remains free of debris. Clear the hole of all debris using a vacuum. With the slotted end facing down, drive the drop-in concrete insert (A) down until its top sits flush with the concrete surface. Ensure that the top is perfectly level. Insert a setting tool (B) into the threaded hole, then hammer down. This will cause the internal expansion plug to set the drop-in concrete insert in place. There are two options for installing the bike bollard cover and inserting the threaded rod. Option 1: Insert the threaded rod after bike bollard cover placement, or Option 2: Insert the threaded rod prior to bike bollard cover placement. Use a cloth to clean off any residue, dust, or debris. Keep the bike bollard cover in its protective packaging and place near the installation site. When ready to install, remove its protective packaging. Lift the bike bollard cover and carefully lower over the pipe bollard. Note: Metal bike bollard covers can be heavy—to prevent accidents and injuries, ensure the proper resources are available to lift bike bollard covers into place or onto their mountings. Lower the threaded rod through the top of the bike bollard cover and into the drop-in concrete insert. Tighten* the threaded rod by hand until it is secure in the drop-in concrete insert. Measure the total distance from the surface grade to the top of the threaded rod. Ensure that this total distance does not exceed the maximum bar height in the product drawing. Note: The maximum bar height differs based on the bike bollard cover model. Refer to product drawings to determine specific measurements. Insert the threaded rod into the drop-in concrete insert. Lift the bike bollard cover and carefully lower over the threaded rod and pipe bollard. Note: Metal covers can be heavy—to prevent accidents and injuries, ensure the proper resources are available to lift them into place or onto their mountings. Place the washer over the threaded rod so that it rests on top of the shaft of the bike bollard cover. Apply the 3/4″ nut to the threaded rod and use a wrench to tighten until the bike bollard cover is secure. Note: Be sure to check the orientation of the bike bollard cover arms before securing the bike bollard cover. Remove the bike bollard cover cap from its packaging. Place the cap on the top of the shaft of the bike bollard cover. Secure and align the cap to the base with the three set screws. Tighten in equal amounts to ensure that the cap remains centered. Place the plastic plugs over the set screws. 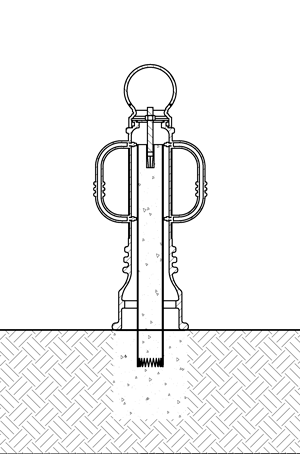 Ensure the bike bollard is plumb to the surface, and the surface is flat. Abrasions should be covered as soon as possible to prevent rust and ensure the proper life of the bike bollard. For damage repair or other servicing needs, please contact Reliance Foundry’s sales department. Reliance Foundry manufactures its products to the highest design standards to ensure their durability. Reliance Foundry’s bike bollards are finished with long-lasting powder coating. In most North American environments, routine inspections and cleaning will ensure that bike bollards retain their aesthetic appeal. Proper care and maintenance are required to maintain the finish and ensure a full service life. Bike bollard covers can be installed using drop-in concrete inserts.